يشكل شقق مانترا بوت هاوس بموقعه الممتاز في Whitsunday Islands نقطة انطلاق جيدة لاستكشاف هذه المدينة النابضة بالحياة. يجذب هذا الفندق ذو 4.5 نجوم، والذي يبعد 0.2 km فقط عن وسط المدينة و 25 km عن المطار، الكثير من الزوار سنوياً. يوفر الفندق بفضل موقعة الجيد وصولاً سهلاً إلى أهم معالم المدينة.
. إن الخدمات التي يقدمها شقق مانترا بوت هاوس تضمن للنزلاء إقامة مريحة. يمكن الاستمتاع بمجموعة من الخدمات على أعلى المستويات في الفندق كمثل صف السيارات, مرافق للشواء, مطعم, جولات, مقهى. لقد جهزت هذه الإقامة الفندقية بعناية فائقة لتوفر مستوى عالي من الراحة. في بعض الغرف يجد النزيل تلفزيون بشاشة مسطحة, غرف لغير المدخنين, مكيف هواء, تدفئة, مكتب. يقدم الفندق مجموعة رائعة من الخدمات كمثل حمام سباحة خارجي, ملعب للأطفال, ملعب تنس, حديقة، لجعل إقامتك تجربة لا تنسى. يحظى فندق شقق مانترا بوت هاوس بموقع ممتاز وخدمات يصعب منافستها. يرجى ملاحظة أن شقق بوتهاوس من أوتريجر تولي أهمية كبيرة لسلامة وراحة جميع النزلاء. هناك سياسة صارمة تمنع إقامة الحفلات في جميع الأوقات. يجب الحفاظ على مستوى معقول من الضوضاء ولا يجوز سوى لنزلاء الفندق التواجد في الغرف بعد الساعة 10:00 PM. وعدم الالتزام بسياسة منع الحفلات قد يؤدي لإخراج النزيل من الفندق. سيحصل النزلاء على ساعة واحدة مجانية للاتصال بالواي فاي طوال مدة إقامتهم وذلك كل 24 ساعة. Beautiful view and apartment, watching the sunset on the balcony was a treat. The apartment itself was well stocked with utilities and facilities. Bathrooms were lovely. Reception staff were very attentive and friendly. Great to be able to use the pool after check out before heading to the airport. Only criticism is that the double bed in the second bedroom wasn’t very comfortable and probably in need of an upgrade. Otherwise great stay. The apartment provided good views of the Marina and provided all amenities needed, minus a dryer. There is a pool and the spa. However, the Spa was not heated, which is a major draw back. There is a single tennis court, which needs to be booked in order to be utilised. This could be an issue if there is more demand for this court, would be better if there was more or other sporting facilities. Otherwise, if you are looking for a place to stay and able to cook home meals for the family. This would be the place to be. 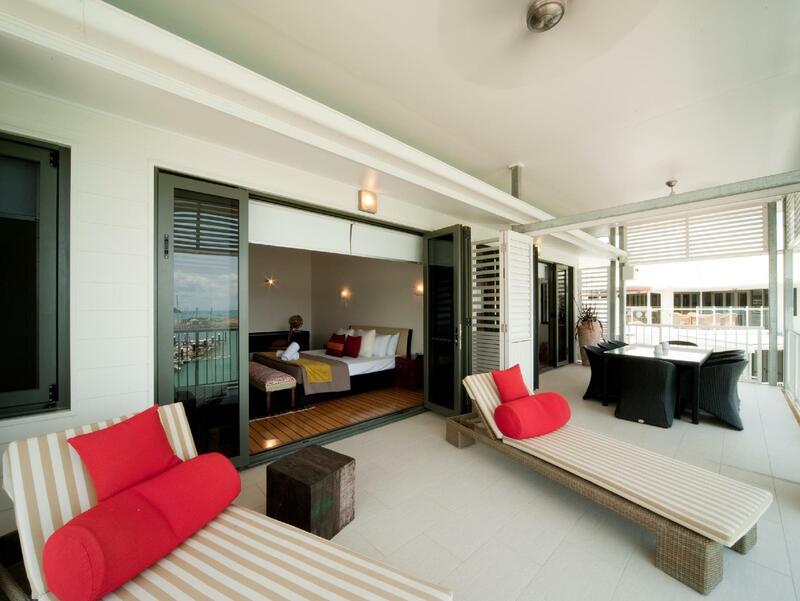 Don't expect perfect facilities, but, this is not the point when you are at airlie beach. Not cheap but excellent value for the money. Excellent location, great facilities, one of the best apartments we stayed in Australia. The only let down was an extremely unfriendly and abrupt brunette at the reception, whoever runs the place should ensure that they get the right people for the job. If you don't like what you do, just don't do it! :) Otherwise totally recommended. Beautiful location for any occasion, peerfect for our pre and post girls night out. Breakfast cafe downstairs overlooking the harbour, quick walk into town, quick taxi back in the wee hours. large two bedroom apartment is modern, with free wifi, nice bathroom amenities brand, comfortable bedding. The apartments were perfect, everything we needed. The view was amazing. Only a 5 minute walk to the heart of town. Not a lot of privacy on the balconies. Nice pool and room. Close to city centre. Great hotel, super great staff. Only downside is their very poor and costly WIFI. But apparently this will change from 2019 onwards. The apartment is conveniently located close to to Port of Airlie. And the apartment was really clean and nice. 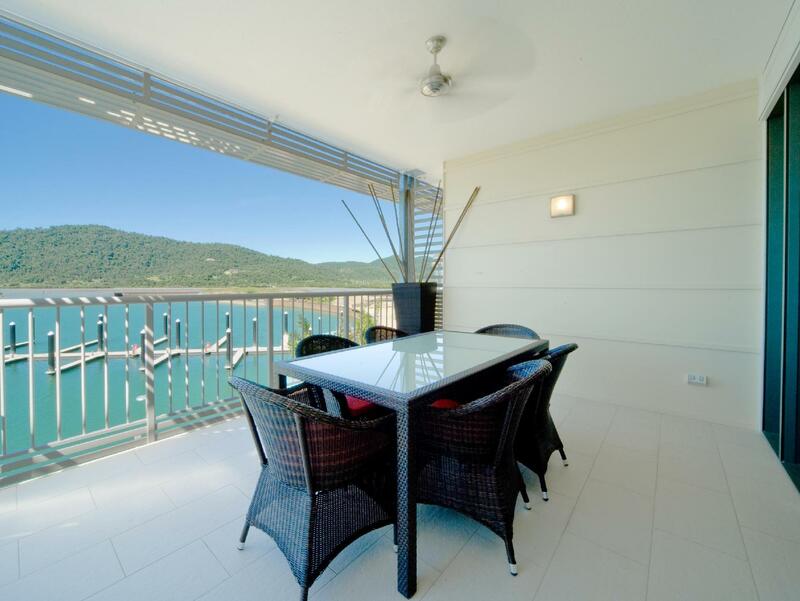 Great option in Airlie Beach. Away from main strip, but easy walk to everything too. Lovely apartments, very clean & modern with a great view over the marina. Only wish they did a 1 bed apartment too as it would have made our stay a bit cheaper, but that's more of a wish that anything! Hotel was good and secure with free undercover car bay. Very nice view, friendly staff, nice beds, clean towels and laundry machine to wash dirty laundry. We 2 bedroom apartment and everything was working except internet. 1 hour/250mb of free wifi per 24h is not enough nowadays...but I can understand updating system in that complex might be difficult. Everything was nice but cooking utensils quite worn and cheap, another problem was ants everywhere in room. Simple surface spray around doorways and windows might have solved that problem. very close to Port of Airlie and can walk to get the boats/activities to the islands very easily. The decor is very colonial and cosy and plenty of space in the three bedroom. Lovely view of the harbour and friendly staff happy to help with anything we need. Will always choose to stay here if in Airlie again. The Boathouse was ideally located. A quick walk to the marina and into the centre of town. The apartment was huge and the facilities were great. 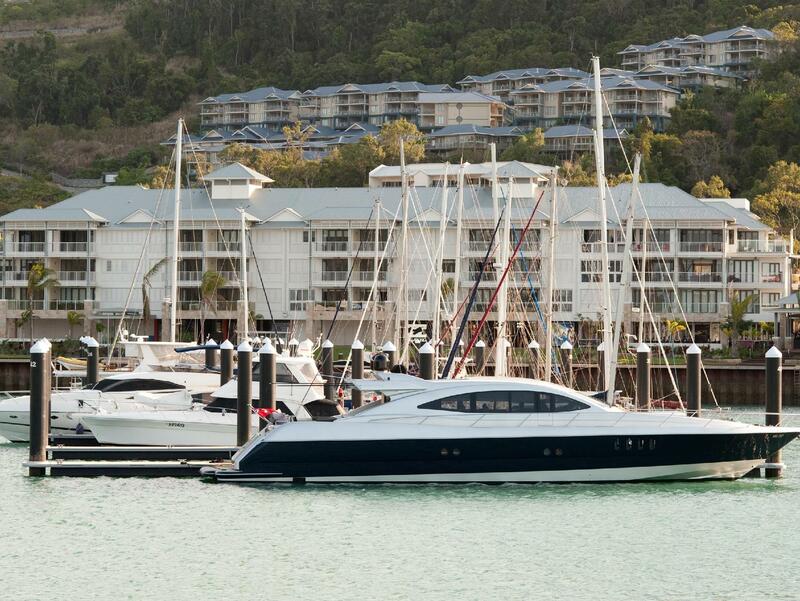 Definitely recommend Mantra Boathouse when staying in Airlie Beach. Wonderful location. Very clean and views were amazing. Staff were very helpful and obliging. Facilities excellent. Would highly recommend these apartments. Cannot fault anything. Thank you for a wonderful stay. It was so good we extended for another night. Stayed to a room where the balcony view was the marina and the front door was the swimming pool. Location is a walking distance to the restaurants. Wifi has an extra charge. It's a self-serviced apartment. The room was clean and the furnitures were so nice.. the staff were very friendly too. Must this is the best hotel during our 12 days travel The apartment is big enough for our big family, all the facilities are available, we can cook something by ourselves. The location is good, only 5 min walk to the WhiteSunday pier, easy for us to join some one-day tour there. It was close to all the best cafes and bars. We went on a subset cruise which boarded 50m away from our room. Great layout and would definitely stay again. Would have preferred the queen in the main bedroom as the 2 singles together was uncomfortable. Right next to the bus terminal in Port of Airlie. Easy access. Great apartment. You have billaboard and cafe right downstairs while only 5-10 mins walk to the town with food and supplies. Nothing we can complain.